The Office of the Superintendent of Public Instruction (OSPI) approved Washington State Journalism Curriculum Guidelines list them as Goals. Today, teachers must list them as either Essential Academic Learning Requirements (EALRs) or as Grade Level Expectations (GLEs). These charts align the state journalism goals accordingly. EALRs and GLEs are used for Communication, Writing, Reading and Mathematics. GLEs at the Grade 9/10 are listed. Of course many GLEs from lower grades also apply, but most journalism programs are in this grade range.Other subject areas do not have GLEs available as yet so they are listed as EALRs only. The complete Washington State Journalism Curriculum Guidelines book should be present in every journalism classroom. Copies are available free of charge at Washington Journalism Education Association meetings and workshops or from Fern Valentine. 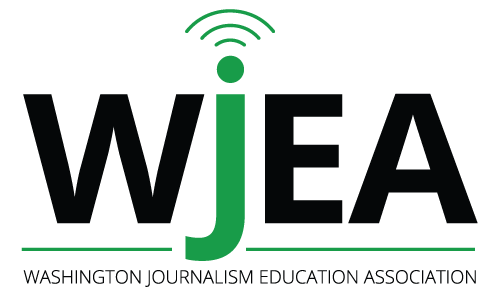 The Washington Journalism Education Association’s goal is to help advisers develop excellent journalism programs.